Saint Martin of Tours, Bishop - Saint of the Day from My Catholic Life! Many great and holy men and women are unknown to history because they lacked the one crucial ingredient to become well known—a biographer. Today’s saint was one of the fortunate ones. A historian named Sulpicius Severus personally knew and interviewed Martin in the last years of Martin’s life and put it all on parchment. In an age of few books, Sulpicius’ Life of Saint Martin was a blockbuster. Over many decades and centuries, it slipped into the bloodstream of European culture until, by the medieval age, the Life was standard reading in all monasteries. Virtually every priest and monk in Europe was deeply familiar with the details of the life of Saint Martin of Tours. The typical biography of a saint for the first few centuries of Christianity worked from the back to the front, from death to life. The real drama was how the saint died, not how he or she lived. Tales of bloody martyrdom, solitary exile, starvation and exposure were as moving and unfortunate as they were common. The Life of Saint Martin told of Martin’s adventures and heroism in living the faith, not just about his last few breaths. He was a saint for the new age of legalized Christianity. Martin of Tours died in his bed. Martin subsequently befriended one of the great men of Gaul of that era, Saint Hilary of Poitiers, who ordained him into minor orders. After various apostolic adventures, Martin was chosen the Bishop of Tours in 372. In his twenty-five years as bishop, Martin was zealous, and jealous, for the House of the Lord. He aggressively tore down pagan temples, which he understood to be dedicated to demons. He traveled incessantly and was untiring in evangelizing the people of the countryside of Gaul and in founding churches. Martin also developed a reputation as a miracle worker and prophet. He cured the eye problems of Saint Paulinus of Nola, Saint Augustine’s good friend. By the time of his death, Bishop Martin of Tours had a well-deserved reputation for holiness. Devotion to Martin spread as Sulpicius’ biography was copied and shared. Numerous churches were named in Martin’s honor in every country of Europe. England had one hundred seventy-three churches dedicated to Martin of Tours in 1800. The Shrine over Martin’s tomb was one of the most popular pilgrimage destinations in all of Europe until France was riven by Reformation violence in the 1560s. In an interesting vestige of Martin’s enduring historic importance, Martin’s feast day in the Breviary is more fully elaborated with prayers and antiphons than almost any comparable saint on the Church’s calendar. 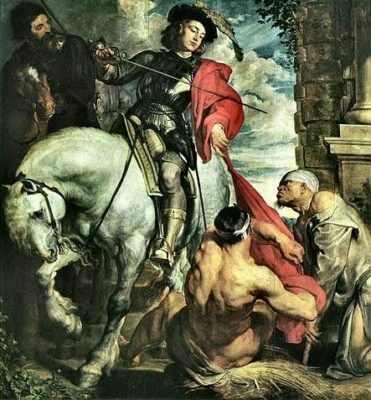 Saint Martin of Tours, your encounter with the beggar has fired the imagination of countless Christians. You were generous in every single way in living your faith. Through your intercession in heaven, assist us now to see Jesus in everyone just as you did then.